All the benefits of a Full Conference Registration, with discounted pricing when you bring 5 or more attendees. Can’t join us for the entire conference? Spend the day with us. Wednesday One-Days include Education Sessions, Living Room Learning and Game Changer Sessions and the Welcome Reception. Thursday One-Days include the General Sessions, Education Sessions, Lunch, NAA Exposition and the Thursday Night Party. 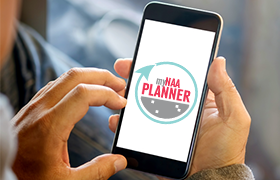 Friday One-Days include General Session, Education Sessions, Lunch, NAA Exposition and the Maintenance Mania National Championship. Executive Exchange includes everything a Friday One-Day includes along with specific programming for upwardly-aspiring executives who supervise on a regional level or above. Executive Exchange included in full conference registrations at no additional cost, but must be registered for. One-Day Registrations not available for purchase by Non-Exhibiting Suppliers. Access to the NAA Exposition Only, includes lunch. Explore the exhibit hall and find the products and services you and your organization to be more successful. Friday Expo Only includes the Maintenance Mania National Championship and lunch. Expo Only Passes not available for purchase by Non-Exhibiting Suppliers. NAA reserves the right to review all conference registrations. If NAA identifies your company as a Non-Exhibiting Supplier, you will be notified and required to register as a Non-Exhibiting Supplier at $3,000. Student ID must be submitted with registration in order to be eligible for the student registration rate. Guest/Spouse Registration is only for individuals NOT involved in the multifamily housing industry. NAA reserves the right to charge the correct member/non-member rate for anyone incorrectly registered as a Guest/Spouse. All registrants will be able to pick up their badges and conference materials at the Attendee Registration area at the conference. Any badges that need to be reprinted on-site for any reason will be charged a mandatory $50 fee. No exceptions. Badges and other registration materials will not be distributed to any registrant that has not paid in full. Only NAA members in good standing will received the published NAA member rate. The non-member rate will be applied to all registrations that do not include a NAA member number. All membership status questions should be directed to 833-86-MYNAA. All substitutions and name changes must be received in writing by June 24, 2019 and are subject to a $50 administrative fee. A letter from the original registrant must be accompanied by the substitution request. After June 24, 2019, all changes must be processed on-site in Denver and are subject to the $50 administrative fee per name change. All cancellations and refunds are subject to a $150 administrative fee. Cancellations received by February 25, 2019 will receive a full refund minus a $150 administrative fee. Cancellations received between February 25 and May 21, 2019 will receive a 50% refund. No refunds will be issued to cancellations received after May 21, 2019. All cancellation requests for refunds must be submitted in writing to NAA Registration at [email protected]. Balance Dues: Badges and other registration materials will not be distributed to any registrant that has not paid in full. No one under the age of 18 will be permitted in the NAA Exposition. No one under the age of 21 will be permitted in the Thursday Night Party. Please contact the NAA Apartmentalize Registration Center.